Commitment is hard. But it’s easier when you share goals and perspectives, like wanting to have two children and a lake house, or feeling comfortable executing your uncle with antiaircraft guns and then incinerating his body with flamethrowers. On Monday, Kim Jong Un and Donald Trump signed a joint statement, and it was very wonderful indeed. 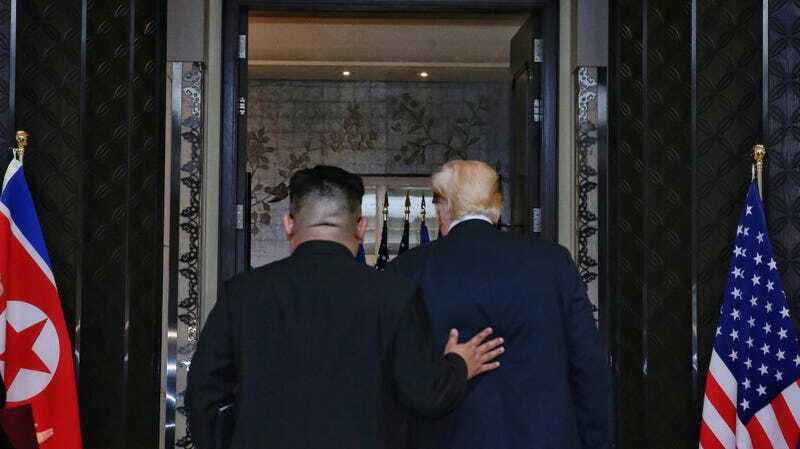 To be alone in this world is a terrible thing, and thankfully, after ditching America’s allies, our president now has the sworn affection of a younger man whose hands are as chubby and soft as his own. Thunder rained down from the heavens. A rose opened its petals, crying out in ecstasy. But even as he spoke, American and North Korean diplomats were struggling to bridge gaps on some of the most basic issues dividing the two sides, including the terms and timing under which the North would surrender its nuclear arsenal. At least 2,500 journalists from around the world were on hand to chronicle what some officials said would amount to an extravagant meet-and-greet exercise. Even if successful, Mr. Pompeo predicted, it would only inaugurate a lengthy, complicated and risky process. A “lengthy, complicated and risky process,” you say? What is love, if not precisely that?